reminiscent of New York Punksters The Ramones. Of course, their songs are crafted with age-appropriate material. Here's what people and the press have been saying about the Boogers. their kids LOVE the BOOGERS!! Click on links to see full articles! 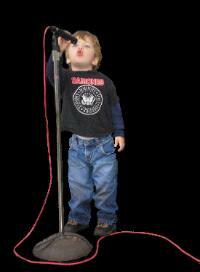 songs are worth the price of the CD alone...Lots of short, fun, loud songs ... perfect for your budding rocker!" "(The Boogers) sound like a cross between The Ramones and a book of nursery rhymes... these guys rock." of "On the Road with the Ramones"
let us know what YOU think...but keep it clean sucka! Why not just call your fans "Booger Pickers"? Works for me! I don't have kids and I still love the songs anyway! Nicely done! to make our little punk band for kids exist. HEY HO LETS GO! Finally I can rock with my Preschoolers!! lOL. Great job!! Love the band. Keep it going guys. Gabba Gabba Hey! Finally rock my little boy can dance to with out me cringing! Finally something to dance to besides backyardigans! Somebody buy this for me, I mean my son, for Christmas. I have been on a mission for great kids music and I found it.